MSI shows off the R9 285 GAMING 2G. This card has a 1000MHz core and 2GB GDDR5 memory clocked at 5500MHz. Cooling is provided by the Twin Frozr IV Advanced cooler. 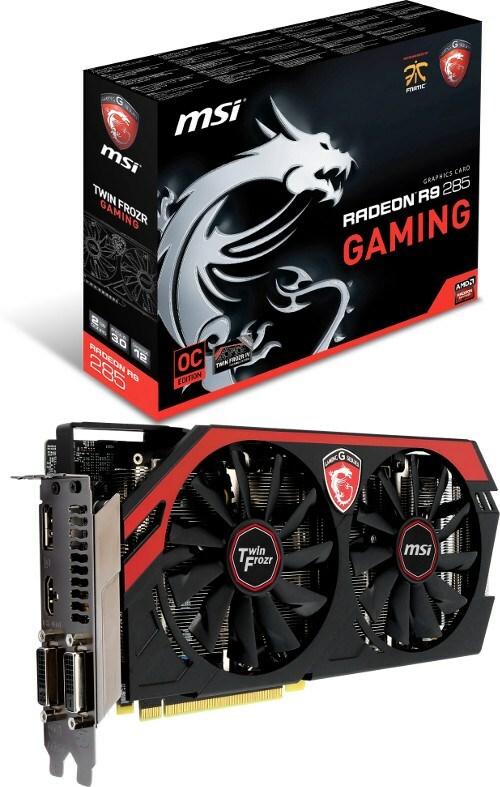 MSI is pleased to announce its latest addition to the popular GAMING series of graphics cards, the R9 285 GAMING 2G. Cooled by the Twin Frozr IV Advanced, the R9 285 GAMING 2G offers an excellent balance between great gaming features and performance with balanced out thermal and acoustic specs. Although the R9 285 GAMING already offers great performance at its price-point, the card offers even more performance through the MSI Gaming app and MSI Afterburner. The latter allows for voltage and power limit adjustment to increase overclockability and performance even further. The new MSI R9 285 GAMING 2G is powered by AMD's newest Tonga Pro GPU. MSI's GAMING series is designed to provide gamers with quality they can rely on. For Graphics Cards this means you get the best thermal solution and components to make sure you stay cool and stable no matter how long your gaming session is. The Twin Frozr IV Advanced is remarkably silent while maintaining excellent temperatures and the Military Class 4 components are designed to remain stable in extreme conditions. The MSI Gaming App puts the gamer in control with a choice of Silent, Gaming and OC modes to utilize performance or silence based on the need of the gamer. Buyers of a MSI R9 285 GAMING 2G are eligible* to choose any title in the new Never Settle: Space Edition program, which includes mega-blockusters like Alien: Isolation and the crowd-sourcing wonder Star Citizen. This adds to the choice of other great titles like Murdered: Soul Suspect and Company of Heroes 2.